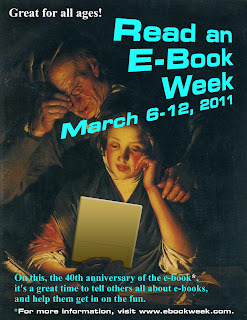 Read an E-Book Week educates and informs the public about the pleasures and advantages of reading electronically. Authors, publishers, vendors, the media and readers world-wide are welcome to join in the effort. We encourage you to promote electronic reading with any event. These could include: public readings, library displays, reading challenges, school visits, newspaper and blog articles, chat show appearances, internet radio interviews, e-book give-ways, and banners on your website. Começou dia 6 do presente mês a Read an E-book Week, iniciativa que visa, tal como o nome indica, promover a leitura de eBooks. Para mais informações, incluindo descontos e ofertas que algumas editoras proporcionam ao longo desta semana, podem consultar o website oficial.